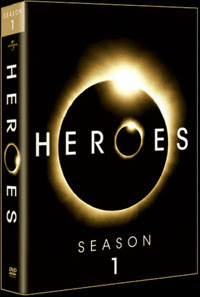 Yeah, being the geek that I am, I still haven't seen a single Heroes episode, believe it or not. I meant to catch it when it aired on free TV in April, but I knew I was too busy to catch every episode, and opted to wait for the DVD. Now that it's finally out on DVD, I'm still not sure if I have time for it, with a new 3D project, a huge backlog of unwatched DVDs and unwritten reviews all begging for attention. Anyway, for those who care, click here for DVDTalk.com's review.